Forms a strong waterproof seal by the simply pressing the Flashband Tape into place by hand, and roller. 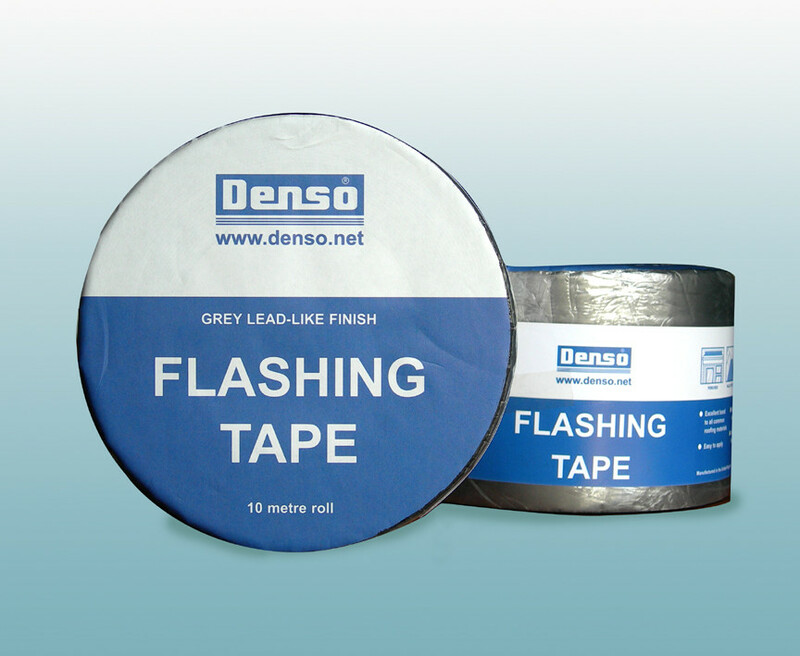 Denso 75mm Flashing Tape: Flashband Roll - High quality, self adhesive flashing tape, for general repairs and sealing. Builders Flashband Tape is a lead coloured, crease resistant flashing tape with a smooth grey covering, with a high grade bitumen backing. It looks like lead, but is easier to apply; Interleaved for easy handling. Be confident to use Denso Flashband Denso Flashband - It will last for years to come! It is not a temporary repair product - It is also used in New Build work. Denso® 75mm Flashing Tape: 3" Flashband Tape - High quality, self adhesive flashing tape, for general repairs and sealing. 3" Builders flashband tape is a lead coloured, crease resistant flashing tape with a smooth grey covering, with a high grade bitumen backing. Looks like lead, but easier to apply; Interleaved for easy handling. 3" Denso Flashband tape has an aluminium foil laminate embedded within the bitumen layers to give greater puncture resistance, improved tensile strength, elongation and tear strength. This offers the user a stronger tape that is easier to apply and accommodates the natural movement of joints, in service, without the loss of adhesion or splitting. 75mm Denso Flashing Tape is a robust Domestic & Commercial Building Product that will last for many years, so you can confidently use this flashing to make new or repair old flashings & soakers in brickwork, and use wider Flashband Tape for valley gutters. 75mm Flashband Tape can be used to flash to Parapet walls, Chimney stacks, Window-kerbs, Upstands & can be used for soakers and joints between brickwork and timber studding prior to tile or slate hanging. 3" Flashband Tape can flash round projections through roofs (cold pipes, roof lights, extractor vents), and as a protective wrapping of insulation covered pipes and tanks. 75mm Flashband Tape may be used to repair lead flashings, felt roofs, cracked roof tiles or slates, cement fibre corrugated sheets, and asbestos cement sheets (sealing in any asbestos fibre!). 3" Flashband Tape seals glazing bars and roof lights in greenhouses, conser­vato­ries, and roof-lights. Clean all surfaces to remove grease or loose debris. If the surface is porous or has a rough or uneven profile, apply Flashband Primer before fixing the flashing strip. Payment - We can take Debit Card, BACS, Cash, Cheque or Credit Card payment online for Denso® 75mm Flashband® Tape. Denso Flashing Tape can be purchased online - just add to basket & carriage is calculated by this weight. Direct Delivery of 75mm Flashband is possible in full carton quantities, and depending on delivery post-code. E. & O.E. see T&C - We do try to keep prices and specifi­cations of 75mm Denso Flashband Tape correct, but mistakes can be made! Please let us us know if you do spot any errors - thanks.